A vegan coffee shop here in Chicago sells rawtella in their cafe. I've heard about this product before so I thought I would try it out. I don't have much to compare it too, though, because I've never had Nutella before (shocking, I know)! Of course, one could always makes their own vegan Nutella. There are several recipes floating around out there that I hear are pretty delicious. The flavor I tried out was the original chocolate hazelnut. I completely understand why people put this on toast now or with bananas. It's good! I imagine rawtella is similar to Nutella and making it would be pretty fun. If you're feeling lazy, though, this is a neat product to have in your cupboard. Speaking of things I have never tried... I've never had a meal of "real" french toast either! I was never fond of the prominent taste of egg and french toast was always too egg-y for me. The Chicago Diner has vegan french toast which I've had there. With this rawtella, I decided to make a vegan stuffed french toast. It was really tasty! It definitely is missing a certain taste of that egg wash feel, but it's a pretty good replacement. Heat the vegan butter in a medium sized skillet over low-medium heat. In a bowl, combine the cornstarch and non-dairy milk well until all clumps are gone. Add the vanilla extract, sugar, flour, and salt. Combine until a smooth batter is formed. 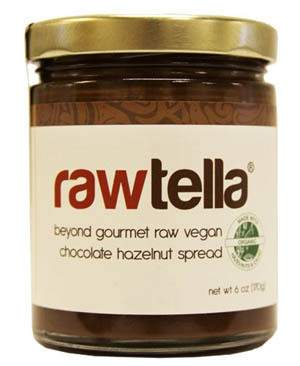 Spread rawtella on one side of each piece of bread. Press together to form a sandwich with the rawtella on the inside. Coat one side of the sandwich with the batter. Fry in the skillet until golden brown. Pour batter over the other side of the sandwich and flip over. Allow to fry until golden brown. Dust with powdered sugar, cinnamon, and nutmeg. Serve with maple syrup and vegan whipped cream. * Note: I used Earth Balance for vegan butter. For non-dairy milk, I used hemp milk as that's what I had. Feel free to use whatever you like. Make sure your sugar is vegan! I found vegan challah bread at the store (which really surprised me). Use any sort of thick, fluffy bread you can find. You want it to be similar to brioche (sans all the eggs in the bread). Soyatoo makes a canned vegan whipped cream that's pretty awesome. They carry it at the Whole Foods near me, but you can order it online too. Rawtella, Nutella, homemade nutella...I could eat any/all of it with a spoon! This French toast looks GREAT! you might like to try adding some chickpea flour to your French toast mixture for more of an eggy taste and texture. Oh, thank you for the idea! I'll have to try it out. Where did you ind the rawtella? I'd love to get some. You can find it online! I got it at a vegan cafe. Happy 5 Year Vegan Anniversary to Your Blog Doll!